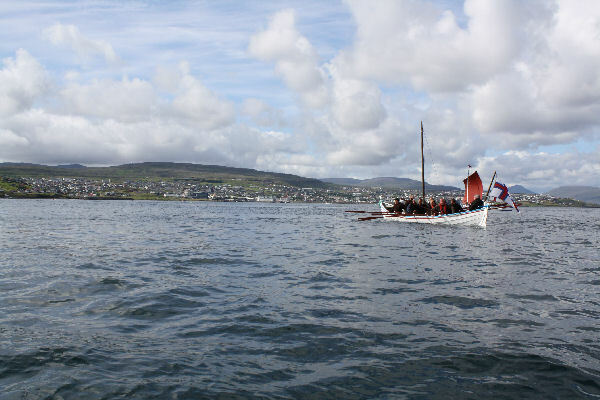 Sigmundur Brestisson, a 10 oar boat, is one of the newer whaling boats in Vágur. Sigmundur Brestisson is built in 1940 for youngsters from Suðuroy, which had travelled to Copenhagen to get an education. The boat was finished in 1940 and was transported to Copenhagen with one of the last trips that Tjaldur (the ship that sailed between the Faroe Islands and Denmark at that time) did before Denmark was occupied by the Germans. During the war the boat was used by youngsters from Suðuroy living in Copenhagen. After the war 10 men in Vágur bought Sigmund Brestisson back to the Faroe Islands. Sigmund Bretisson is 26,7 feet long, 6,1 feet wide and 2,0 feet deep.